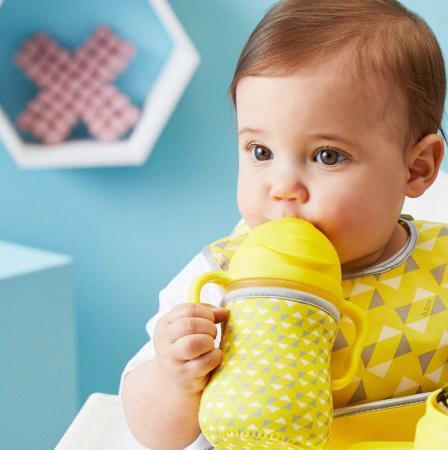 Get the New Style BBox Sippy Cup with Neoprene cover of your choice for only $19.95! While stocks last. We’ve done it again! Our award winning sippy cup has been updated and redefined! Featuring our innovative b.box weighted straw that moves with the liquid – whatever angle the cup is tilted. Our newly designed straw has a unique two-way valve, ensuring easy drinking and NO leaks! Which means no more crying over spilled milk . Still available in your favourite colours, with a premium matte-finish. Personalise your sippy cup with b.box’s NEW insulating neoprene sleeves. Reversible designs – the perfect accessory for b.box’s most loved cup! Helps insulate liquid and protect your sippy cup base from life’s little knocks and toddler antics. Match your style with our new travel bibs to take the look next level. Staying cool, or warm, never looked so good.